Primary and additional cardholders both enjoy next level benefits, with Qantas Premier Titanium - the only credit card to offer you 20% bonus Status Credits when you book and pay for eligible Qantas flights using your card1. You must book a Qantas operated or Qantas advertised flight via qantas.com or via Qantas Premier Titanium Concierge. You must use a Qantas Premier Titanium card to pay for your flights in full (no Points + Pay). 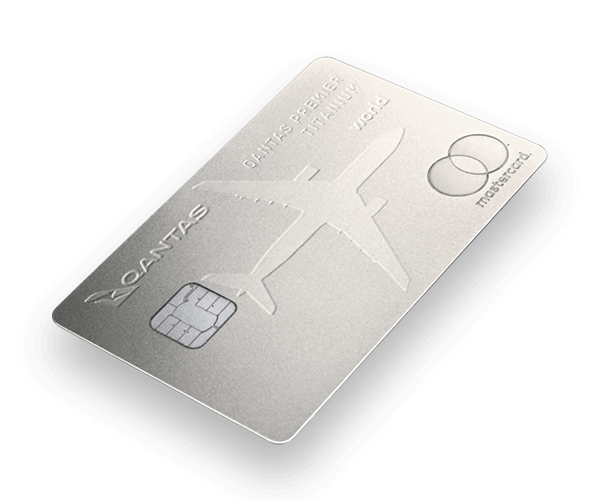 Book on Qantas.com or via your Qantas Premier Titanium Concierge using your Titanium Card. Fly on a Qantas marketed and Qantas operated flight. Bonus Status Credits will be awarded to the flyer, and are shown in their Frequent Flyer points history statement 72 hours after flying. Taking credit card benefits to new heights, Qantas Premier Titanium offers a 10% discount on eligible Qantas flights for up to two bookings per a year for two people on all fare classes (both international and domestic flights). To enjoy your savings, please remember to book your travel through your Qantas Premier Titanium Concierge2. Flights must be booked via the Qantas Premier Titanium Concierge. Flights must be paid for with your Qantas Premier Titanium card. Offer is available for any fare or cabin class. Limited to two times per year, for two people. To book your 10% flight or to change a booking, please call Qantas Premier Titanium Concierge. You will find their number on the back of your card or in the Qantas Money App. You are also able to change bookings at Qantas.com. For further details, please refer to the Qantas Premier Credit Card Airline Benefits Terms and Conditions. Accepted by merchants worldwide, and with our highest earning rate3, the Qantas Premier Titanium Mastercard® offers you more potential to earn. Share the Qantas Premier Titanium experience with two complimentary Qantas First Lounge Invitations and two additional Lounge Invitations, per year, for use in both Qantas Club Domestic and selected International Business Lounges. To enjoy your invitations, please remember to link your complimentary Lounge Invitation to your eligible flight before you travel4. First Lounge Invitations can be used at SYD, LAX and MEL international airports. First Lounge Invitations can be used on any QF, JQ, 3K, GK, BL numbered flight. First Lounge Invitations can be extended to a guest who is flying with you. They can’t be transferred to another QFF member travelling separately. Business Lounge Invitations can be used at any Qantas Operated International Business Lounge (except LAX) and domestic Qantas Club. A primary cardholder will be able to invite a guest to enter the lounge with them provided they are travelling on the same booking. Log in to the Complimentary Lounge Invitation Portal. Ensure this is done at least 24 hours before your booked flight departure. For further details, please refer to the Qantas Premier Credit Card Airline Benefits Terms and Conditions. The rewards really add up with Qantas Premier Titanium. Starting with 150,000 bonus points that could be yours, simply by becoming a cardholder and then spending $5,000 or more on eligible purchases on your card within 90 days of approval5. Along with 0% p.a. for 6 months on Balance Transfers7 until 30 May 2019 (reverts to cash advance rate thereafter, currently 21.99%). No interest free days apply to retail purchases while there is a balance transfer. You must be a new Qantas Premier Titanium cardholder. Successfully apply for a Qantas Premier Titanium credit card by 30 May 2019. Bonus Qantas Points will be credited within 6 - 8 weeks of meeting the spend criteria. Offer may be extended or withdrawn at any time5. Enjoy the same wines you experience in flight, at home. Offering a selection of specially curated wine and gourmet food, your Qantas Wine Premium Membership includes access to exclusive wine products, member-only offers and wine tastings events. As well, earn an additional 3 points on top of any other Qantas Points earned with Qantas Premier Titanium; along with free delivery within Australia8. The primary cardholder must join and become a member of Qantas Wine. User must be 18 years of age and over. Call your personal Wine Advisor on 1800 505 004 to register your membership. Log in to Qantas Wine. Purchase using your Qantas Premier Titanium credit card. Make shopping more rewarding with your Qantas Premier Titanium credit card and earn bonus points when you shop at your favourite stores9. You must be a Qantas Premier Titanium cardholder. Download the Qantas Money App. Log into the App and accept the Terms and Conditions. Tap on the ‘Card Offers’ tile. Activate any offers that interest you. Meet the criteria of the offer. Your Qantas Premier Titanium credit card offers you another way to increase your points earning potential with up to 20,000 points a year through the Qantas Wellbeing App. Download the App at qantas.com/wellbeing to start earning points for everyday activities10. You must be a Qantas Premier Titanium Primary cardholder. You must install the Qantas Wellbeing App. Download the Qantas Wellbeing App. Participate in the highest daily and weekly challenges and win every weekly group challenge to earn 20,000 Qantas Points. Your Qantas Premier Titanium concierge is at your service, allowing you to book Qantas flights with your 10% discount, book concert tickets or to make a restaurant reservation. Available to you 8am - 8pm, seven days a week. Call your dedicated concierge on the number found on the back of your Qantas Premier Titanium card, or within the Qantas Money App. When you travel overseas, Qantas Premier Titanium offers more reassurance with cover such as medical emergency, travel cancellation, purchase protection and 180 days of coverage. Additional Qantas Premier Titanium cardholders are also covered by Complimentary Travel Insurance11 - even when they are not travelling with you. For any assistance you may require, please call 1300 791 804; or if overseas, Chubb Assistance on +61 2 8907 5666. All eligible travellers’ airfares must be paid for with your primary or additional Qantas Premier Titanium credit card. Travel must start and end in Australia. Travel must be domestic or international. Your level of cover is dependant on the type of travel i.e. international or domestic. Enjoy 6 months interest free on your first purchase of selected Qantas products and services, including Qantas flights, Qantas Club fees, Qantas Gift Vouchers, Qantas Store and Qantas Wine purchases – plus more12.